Kit Harington was born in London, United Kingdom, on December 26, 1986, is an English actor. Young Kit Harington began his acting career in National Theatre's adaptation of War Horse in role as Albert. He made his big screen debut in horror movie Silent Hill: Revelation (2012) in role as Vincent Cooper. 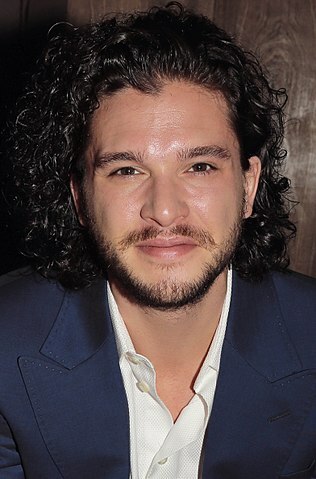 Kit's breakthrough performance came as Jon Snow in HBO television series Game of Thrones, since 2011, for which he was paid £2 million per episode. He was honored with Actor of the Year at the Young Hollywood Awards 2013. Has a fear of spiders and flying. He has never had long hair before Game of Thrones. He voiced Eret in film How to Train Your Dragon 2 (2014). He married actress Rose Leslie in 2018. Lives in Canonbury, London and Ipswich, Suffolk. I just don't know anything about fashion. There's a huge difference between stage fighting and real sword fighting. You have to look at your blessings, don't you? With Thrones, I have to realize that, whatever happens, and for all the stress and the pressure that goes with it, it's been an extraordinary journey and I know I'll look back later in my life and think, 'That was crazy, that was amazing.' It's something that very, very few people experience, and I love that. You don't want to seem too eager, too romantic - otherwise, it just looks a bit try-hard. But I do think that a first date should be intimate. So I'd choose a nice dinner somewhere cozy, not too crowded, with good wine.